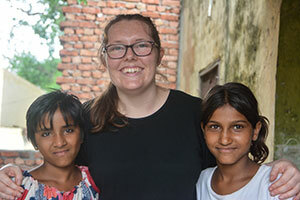 Twelve student volunteers from across the University travelled to India this summer, to live and work at the Laksh Foundation, a small NGO in Haryana, India which offers free extra-curricular tuition and supervision to around 300 children, aged between 3-18. 1. To help educate and inspire the children in the community, many of whom do not regularly attend state schools and often drop out early without gaining formal qualifications. 2. To work with the local teachers themselves, focusing on their spoken and written English, building their confidence in the classroom and introducing new and innovative methods of teaching. As well as making a difference in the local community, the programme also provides volunteers with an exciting and meaningful experience. "I have gained an opportunity that I will never get again. I have made friends that I hope I will stay in touch with long into the future. I have had an insight into a culture that only few would be able to see. I have gained a confidence in my ability to teach and have a fresh outlook on the world. I feel I am able to see what is important now... the experience was wonderful in so many ways." 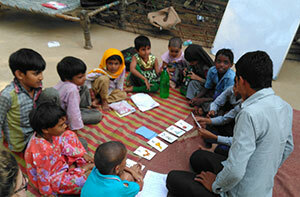 Hear more from the volunteers about their experiences in India in their blog. Recruitment for the 2016 project is now open. If you know of any current students who enjoy a challenge and have some teaching experience then please encourage them to visit the website and apply.